Warming, filling, and delicious, this herb flavoured white bean stew is delightfully vegan and will definitely bring warmth on a cold winter day. If you don’t have winter savory, sage or rosemary would be the perfect substitute. Put beans into a large saucepan, cover with 5 cups water, and let soak overnight. Bring it to a boil. Reduce heat to medium-low and simmer until beans are tender, about 1 hour. Drain beans and set aside. Heat the olive oil in a large saucepan over medium-high heat. Add the garlic and cook briefly. Add the tomatoes, white beans, and winter savory leaves. Bring to a boil. Reduce the heat to medium-low and simmer, stirring occasionally, until the sauce has thickened and the flavours have mingled, about 20 minutes. Season with salt and pepper. Serve warm. Warm, soft, slightly sweet and full of flavor, these poppy (or peanut butter) filled whole wheat buns topped with almonds (or sesame seeds) are perfect for an after-school snack or a morning indulgence with a pot of steaming tea! Combine together the wholemeal flour and water in a small pot until the mixture is well blended and lump free. Cook the mixture over the medium heat, frequently stirring, until it has turned into a thick paste and the thermometer reads about 65C/150F. It takes about 2-3 minutes. Cool the mixture to the room temperature and cover with a plastic wrap while you prepare other ingredients. In the pan of your bread machine, pour in prepared starter, milk, egg, walnut oil, caster sugar, salt, flours, and the yeast. Program the bread machine to dough cycle. Scrape the dough out onto a lightly floured work surface and press it down to flatten. Divide the dough into 10 portions, each about 92 grams. Roll each portion of dough into an oval. Spread 30 grams of poppy paste or peanut butter at one end, and then slice the other end into 5 strips. Now roll the dough up from ‘filling’ side and seal the edges. Cover and proof the bread until doubled in size, about 1 hour. Preheat the oven to 180C/350F. Brush the top with egg wash (1/2 egg beaten with 1 tsp water) and sprinkle with sesame seeds or almond slices. Bake in the middle of hot oven for 20-25 minutes until nicely golden brown. This delicious homemade herb-flavoured tomato soup is healthy, creamy and easy to put together. It is best enjoyed with some cheesy croutons. The recipe calls for the canned tomato, so pick the best quality canned tomatoes you can find, for example, Roma, San Marzano. Preheat oven to 180C/350F. Place the cubed bread in a large bowl, add in minced garlic, 2 tablespoons of the grated Parmesan, black pepper and olive oil, and toss until the bread is evenly coated. Pour the mixture onto a baking sheet and bake for 15 minutes. Remove, and stir the croutons. Return to oven, and cook for 20 more minutes or until browned and crunchy. Remove and toss thoroughly with the rest of grated Parmesan and chopped parsley. In a large pot, heat olive oil over medium heat. Add onion, celery and carrot and cook until tender, about 10 minutes. Add tomatoes, tomato paste, vegetable broth, bay leaf, a pinch of clove and dried basil. Bring to a boil, then reduce to a simmer and cook until carrots are very tender, about 30 minutes. Discard the bay leaf. With an immersion blender, puree soup until smooth or puree in batches in a food processor fitted with knife blade. Season to taste with salt and pepper. Whisk in soya cream and heat through over the low heat. Ladle into bowls and place a few pieces of croutons in each, topped with a slice of shaved Parmesan cheese. Place under broiler until cheese is melted. Sprinkle the chopped chives on top if used. Happy Lunar New Year 2012! 祝福大家龙年行大运，行运一条龙！Happy Dragon Year 2012! This multigrain seed bread ring is made with rye, oats, millet, sunflower seeds, sesame seeds and fennel seeds. It’s delicious, crispy, hearty, nutritious and easily adjustable to what you have on hand. If nutrition, to you, is not the top priority, then wholegrain rye and spelt flours can be replaced with wheat flour. Place rye groats, oats, millet, sunflower seeds, and roasted sesame seeds in a mixing bowl. Pour in 300 ml of hot water. Mix well and leave it aside for 3 hours. In another bowl, stir roasted rye bread pieces and 100 ml of hot water together. Leave it aside for 3 hours. In the mixing bowl of your stand mixer, add in water, yeast, grain and seed mixture, bread paste, sourdough starter, wholegrain rye flour, spelt flour, salt, malt extract and fennel seeds. Stir all the ingredients on the low speed for 2 minutes. Increase the speed, and mix for 5 more minutes. Place the dough on a floured work surface, cover with a towel, and let rest 20 minutes. Knead briefly. Cover and let rest for a further 20 minutes. 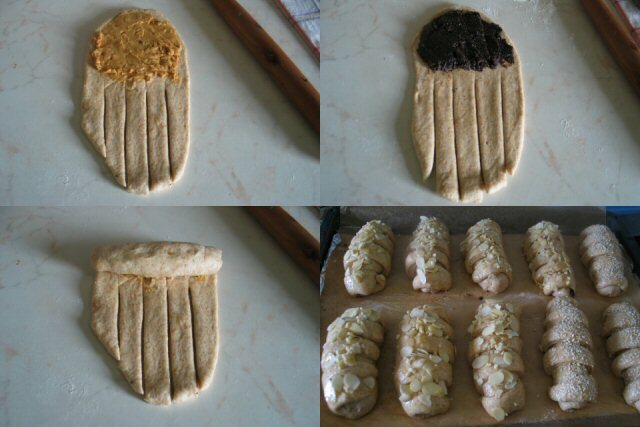 Divide the dough into 3 portions. Shape them each into a ring or a round. Brush the tops with water and sprinkle with seed topping if used. Let rise for another 40 minutes. Preheat the oven to 230C/450F. Cut the tops of bread rings with a sharp knife, 1-cm-deep, about 2-inches apart. Bake in the preheated oven for 15 minutes. Lower the temperature to 210C/410F and bake for a further 30 minutes until crisp and golden brown. Once the winter chill comes in, many of us long for some comfort food. Soups are a healthy and satisfying choice of the season. Today I am sharing with you an easy broth-based soup filled with fennel, potato, soya cream (optional) and flavoured with saffron. If you prefer a lighter version, just leave out the soya cream at the final step. Fennel bulb is an excellent source of vitamin C, which is the body's primary antioxidant and a necessity for the proper function of the immune system. In addition to its vitamin C, fennel is a very good source of fiber and potassium. Trim the fennel by removing the thin stalks and the thick base. Cut the bulb into 1cm pieces. Peel the potatoes and cut into 1cm pieces too. Finely dice the shallots. In a saucepan, heat the olive oil and add in the diced shallots. Cook until aromatic and softened. Add in prepared fennel and potatoes. Sautee for 3 minutes. Add in vegetable stock, saffron, and bay leaf. Bring it to the boil. Reduce the heat and simmer, covered, for 25 minutes, or until the vegetables are tender. Remove the bay leaf and puree the soup with an immersion blender. Stir in the cream and season. Serve in hot bowls with some chopped fennel fronds on top. A classic German apple cake with marzipan. The marzipan paste, made of sugar and almond, is used in the cake batter to enrich the flavour and texture. If you are an almond lover, feel free to use more marzipan instead of sugar, and adjust accordingly flour quantity. The batter should look like a smooth and thick paste. I do still use my favourite wholegrain spelt flour, but you can use wheat flour (wholegrain or not) instead if you want. Allergic reaction to eggs? No problem, use 1 cup of applesauce instead of 3 eggs. After baking, a glaze could be created to brush the apples by warming 2 tablespoons of water and 3 tablespoons of apricot jam together. I chose to leave it. It’s rich and sweet enough for me. Peel apples, cut into quarters lengthwise, and remove cores. Slice deep lines along the length of the apple quarters and sprinkle with the lemon juice. Line a 30x12x9-cm loaf pan with baking paper. Preheat the oven to 190C/375F. Roughly grate the marzipan. Place them in a mixing bowl together with butter, sugar, almond extract and salt. Beat until creamy. Add in eggs, one at time, beat until well combined. Whisk together the wholegrain spelt flour and baking powder. Sift the flour mixture into the butter mixture. Stir until just incorporated. Spread the batter into the prepared loaf pan. Arrange the apple quarters over the top, cut side up, pressing lightly into the batter. Bake for about 30 minutes. Cool the cake on a wire rack to room temperature. Dust the surface with powdered sugar if desired. 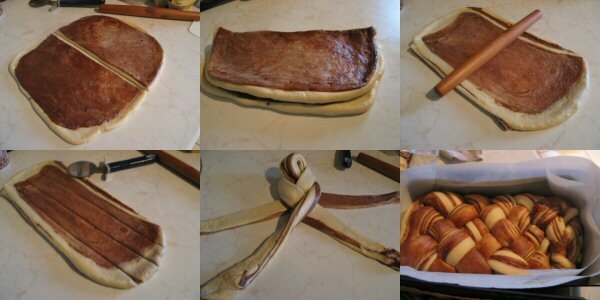 This is basically a sweet yeast bread swirled with chocolate-flavoured dough and formed into a two-toned braided loaf. It might seem to be difficult to make but it is simply a braided challah with two-toned effect. In the bowl of a stand mixer, combine all the ingredients in the order given except the dark chocolate cream and ground flaxseed. Using a dough hook, mix everything together until a soft dough forms. Turn the dough out onto a lightly-oiled surface. Combine the dark chocolate cream with 1/3 of dough. Knead each portion for a few minutes to form two smooth and elastic balls of dough. Place two dough balls separately on two lightly greased bowls. Cover with plastic wrap and let rise until double in size. After dough balls have risen, roll and stretch each dough into approximately a 10 x 6-inch / 25 x 15-cm rectangle. Place the chocolate dough on top of plain dough, then roll it out to a 12 x 8-inch / 30 x 20-cm rectangle. Cut the rectangle into half, so you have two 6 x 8-inch / 15 x 20-cm rectangles. Now stack one rectangle on top of the other and roll it out again to a 12 x 8-inch / 30 x 20-cm rectangle. Repeat the above steps twice more. Slice the rectangle into 4-6 strands, leaving one end intact, and braid the strands to form a loaf. Place it in a loaf pan lined with baking paper. Cover with the plastic wrap and allow it to rise in a warm place for 45 minutes or until it doubles in size. Preheat the oven to 175C/350F. Spray the top of the loaf with water and sprinkle the ground flaxseed over. Bake for about 30 minutes until golden brown. A quick, light and tasty salad with leftover pan-seared chicken breast (turkey could be used instead here), antioxidant-rich radicchio, kiwifruit, cherry tomatoes, physalis (aka cape gooseberry) tossed with a fresh, fruity and delicious kiwi vinaigrette dressing. So If you feel stuffed and want a a healthy and soothing meal after holiday feasts, this salad might be what you need. To make the dressing, combine all the ingredients in a blender and process until smooth, about 5 to 10 seconds. Pour into a serving container and refrigerate until ready to use. Cut the chicken into bite-size pieces. Coarsely chop the radicchio leaves. Arrange the radicchio and onions on a large serving platter. Top with chicken, kiwi,tomato,and physalis halves. Serve with kiwi vinaigrette.